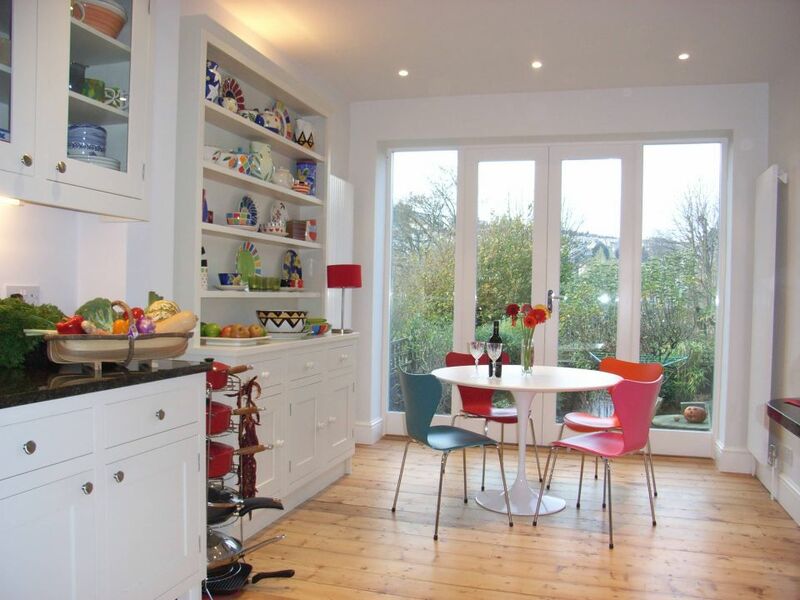 Style Within has been designing and installing beautiful kitchens in Bath and Bristol for the past 14 years. 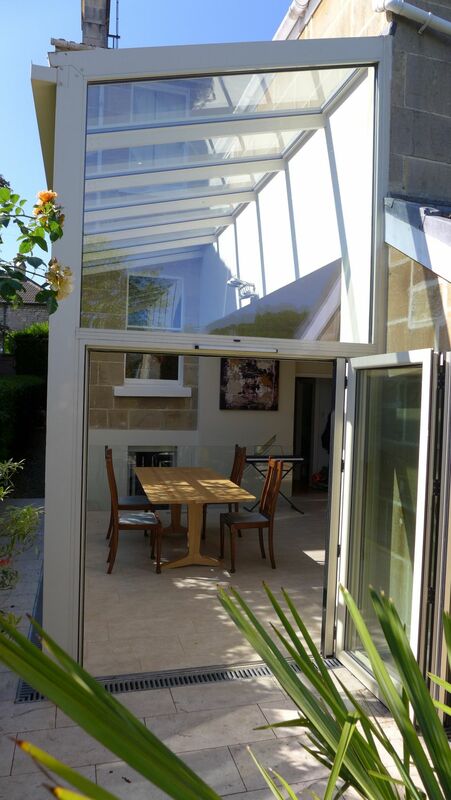 We cover everything from concept to installation. 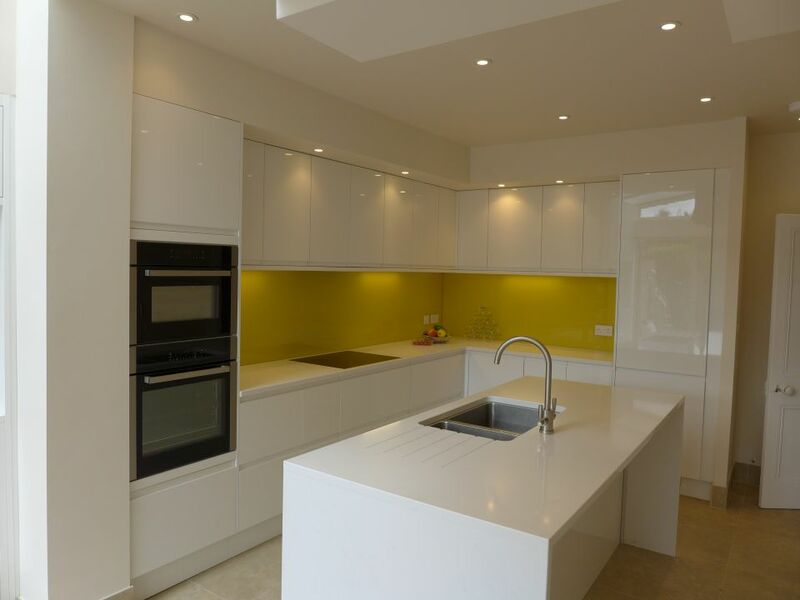 Our designs include new lighting, heating, flooring, decoration as well as building work – everything you need for your kitchen. 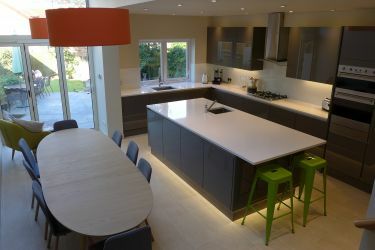 We are absolutely delighted with our extended, open plan kitchen diner and would highly recommend the design and project management of Nick Prescott at Style Within. 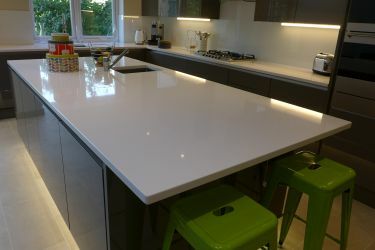 Having decided that we wanted to extend our existing kitchen to create an open plan kitchen diner, we discussed the prospect of a joint project with our adjoining neighbours, who were also keen on a similar build. 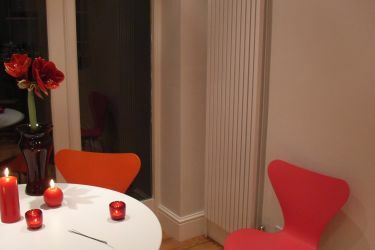 Sally & Mark, Bathwick, Bath. 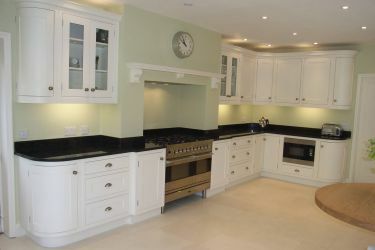 Here is a selection of our kitchens. 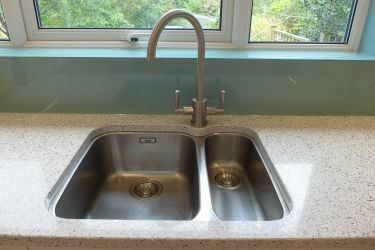 Below each photo you’ll find a link to the specific renovation so you can see the transformation from “before” to “after”. 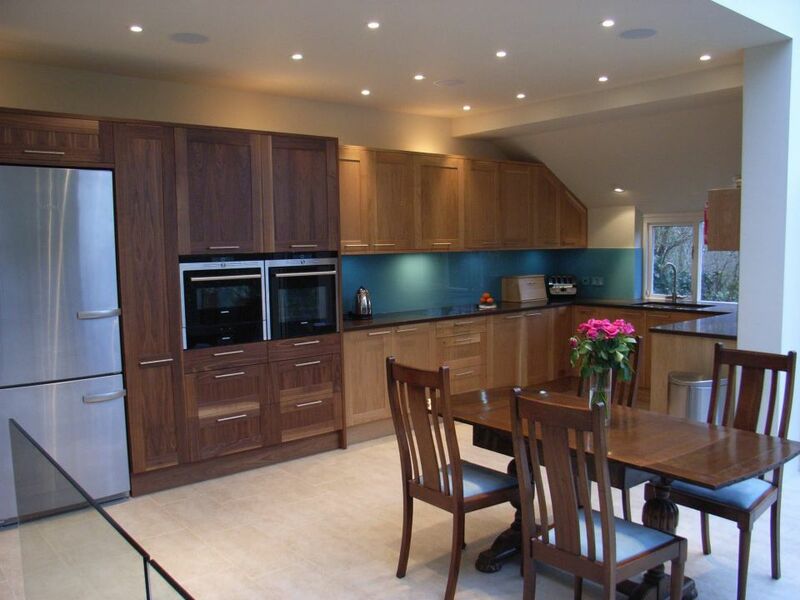 Whether your taste is modern, classic or traditional, we lead you through the options. 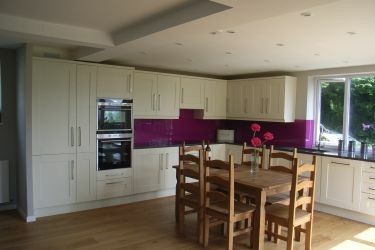 This kitchen was installed as part of a side return extension. 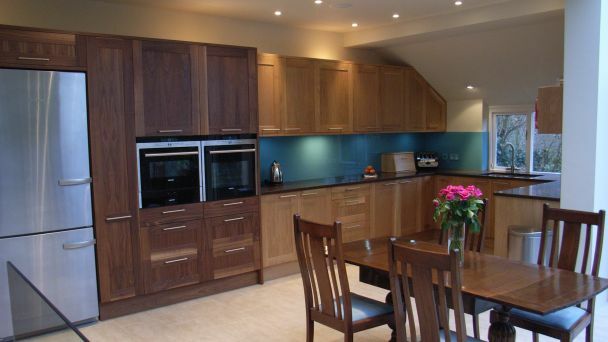 The cabinets are a two-timber combination of European Oak and American Dark Walnut veneers. 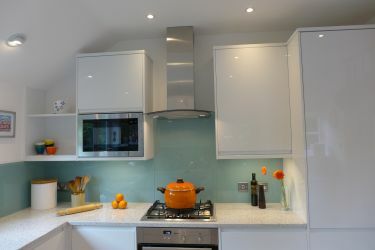 The blue glass splashback and quartz worktop complement the units with a porcelain tiled floor over wet underfloor heating. 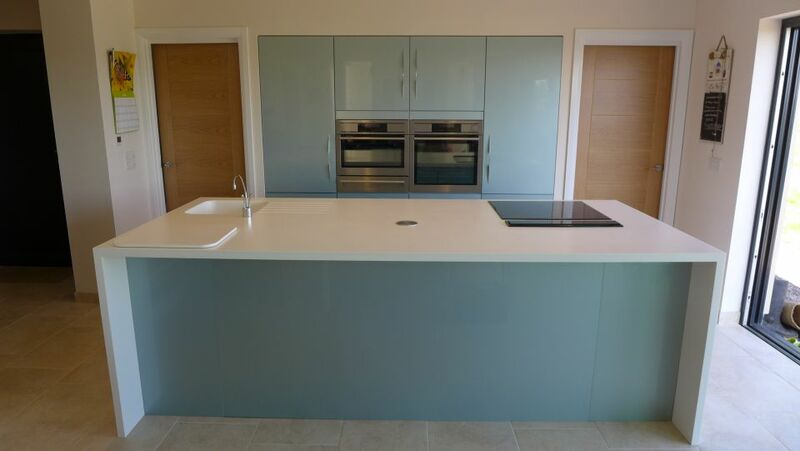 A modern, ice-blue gloss kitchen, bristles with functionality including a pop-up (downdraft) extractor, boiling tap and waste disposal. 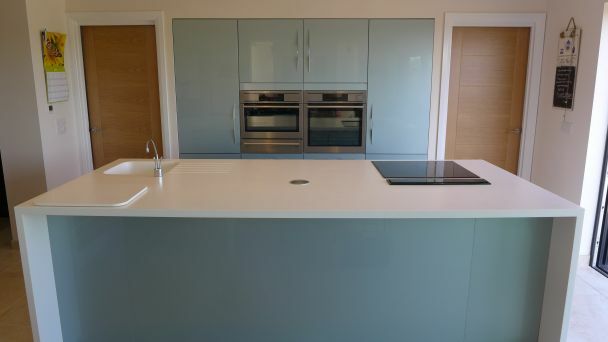 A knee space creates a breakfast bar in the large island with a moulded sink in the acrylic worktop. 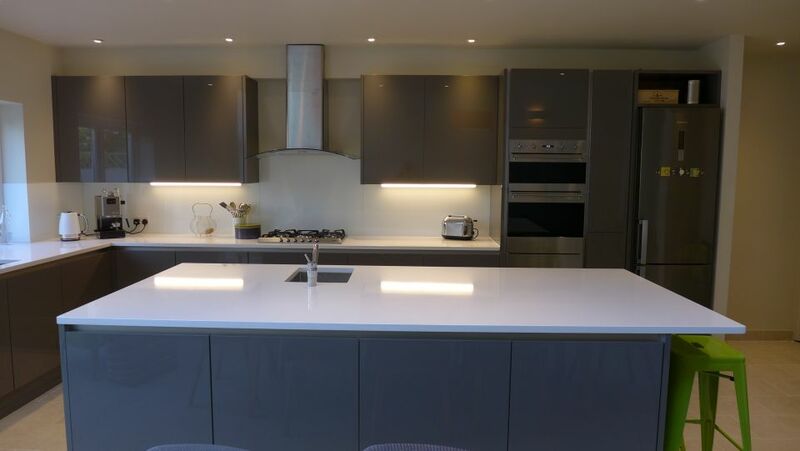 This modern, gloss grey kitchen has integrated handles for a sleek appearance. 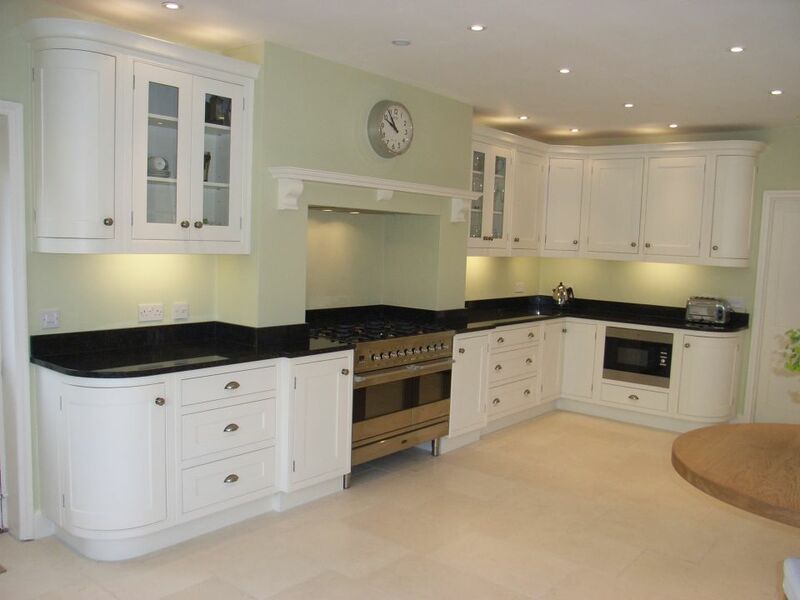 This classic shaker kitchen design has bespoke, hand-painted cabinets packed with practical features. 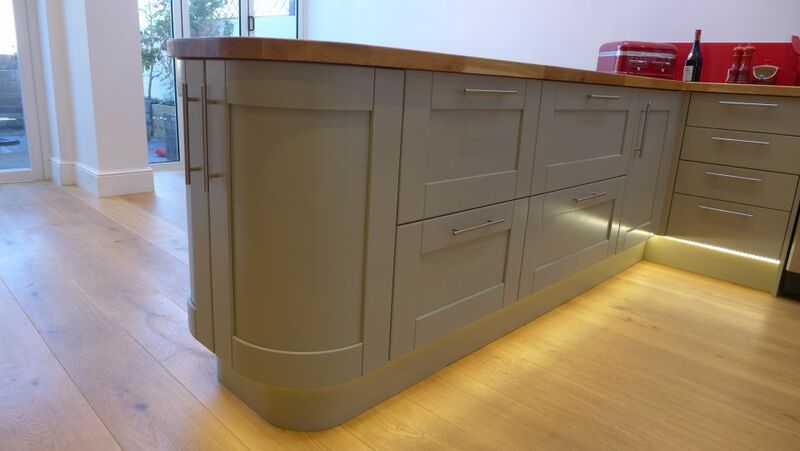 Another bespoke kitchen, this time a hand-painted, solid timber design in shaker style. 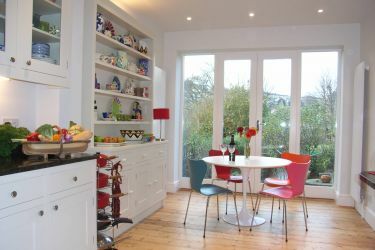 A knock-through renovation with significant structural change, this kitchen diner sees new french doors to the garden. 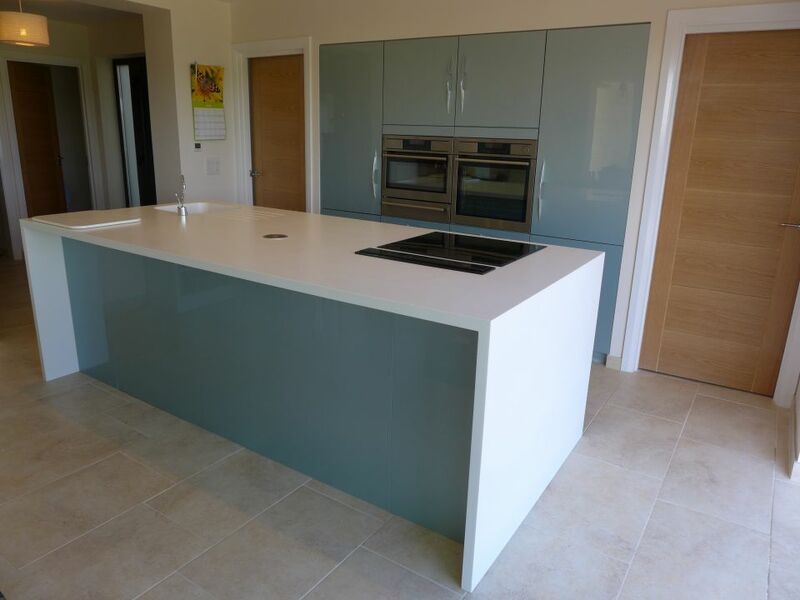 Many of our designs involve knocking through or extending to create a kitchen-diner for our clients seeking an open plan arrangement. 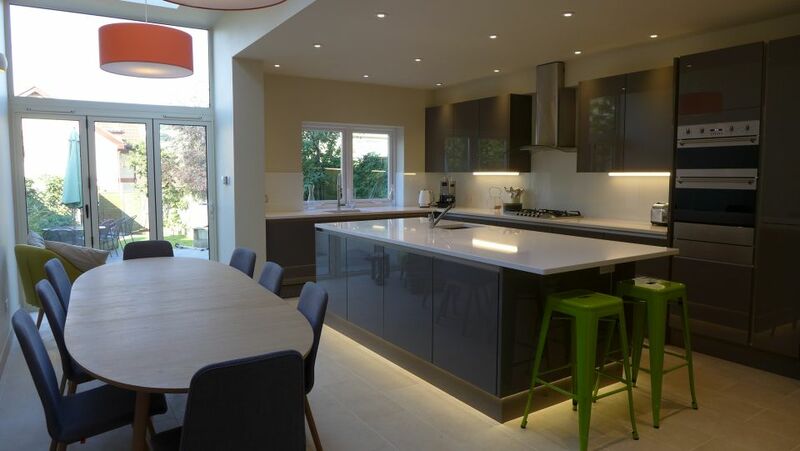 We designed this kitchen-diner as part of a glass side return extension. 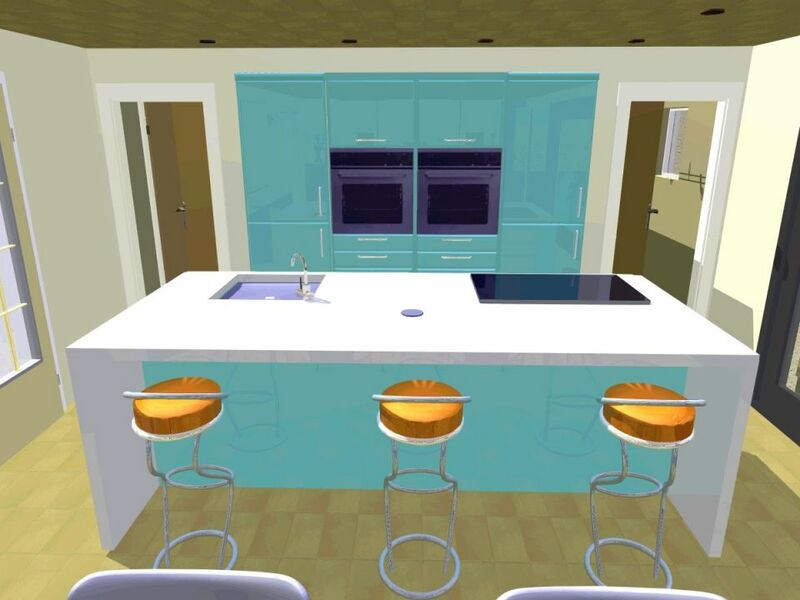 To help you visualise your proposed new kitchen, we produce 3D visuals before finalising the design. 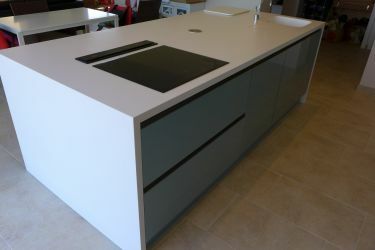 In parallel, we bring samples of the actual finishes to give you the complete picture. 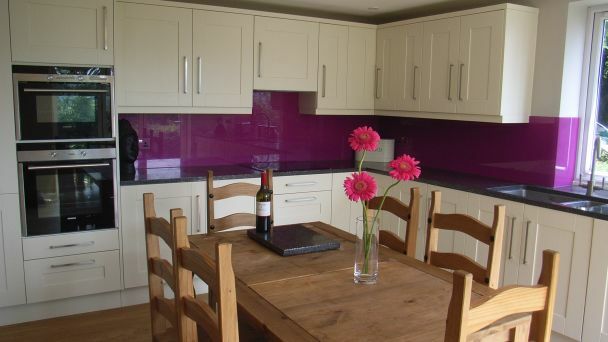 If you’d like us to design and manage your new kitchen renovation, please call 07711 857670 or use our contact page.